The 9th edition of the Internet Governance Forum (IGF), held in Istanbul at the beginning of October, marks a significant turning point regarding how the global dialogue on Internet Governance (IG) has evolved since the forum was first launched in 2006. In these nine years, the forum has gone from a mere talk shop to a major event where all the public policy issues related to the internet ecosystem are discussed. This year’s theme, “Connecting Continents for Enhanced Multistakeholder Internet Governance”, was inspired by the geographic location of Turkey, the host country and sponsor. The unprecedented clamp downs on freedom of expression in Turkey in early 2014, such as shutting down Twitter and Youtube, raised serious concerns of human rights advocates and international media about the state of Internet freedom in a country “known” as the best example of a progressive democracy in the region. For this reason, IGF Turkey presented a perfect opportunity to involve an important segment of the Internet community’s poorly represented voices in the global discussion. 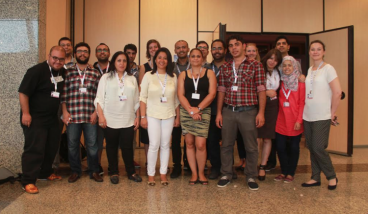 Hivos’s Programme on Internet Governance Middle East North Africa (IGMENA) supported the participation of a group of fellows representing the wider civil society from the Arab region. The main objective of this immersion exercise was to engage civil society representatives from this region on equal footing with different stakeholders in the international discussion over IG and policies. IGMENA also co-organised a workshop on “Human Rights for the Internet: From Principles to Action” which generated a constructive discussion on how to raise awareness about human rights online, and how human rights affect IG agendas.